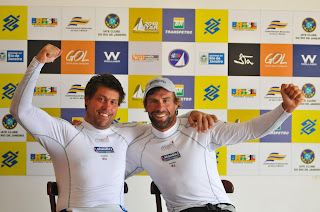 Iain Percy and Andrew "Bart" Simpson (GBR) were crowned 2010 Star World Champions today. The reigning Olympic Gold Medalists continue to add treasures to war chests. Percy's sterling collection of championship titles includes the 2002 Star World Championship and an Olympic Gold Medal in the Finn in 2000. Their last Star regatta was Sail for the Gold in Weymouth, where they won the Gold. They did not compete in the 2009 Star World Championship nor did they compete in the Taca Royal Thames and South American Championship earlier this season. They had t wo practice sessions leading up to this regatta. Percy commented at the pre-regatta press conference, "Sometimes short, sharp training sessions can work in your favor." This victory places Percy in the rarified company of Torben Grael, Mark Reynolds, Bill Buchan, Jr.; Lowell North, and Agostino Straulino as a Star skipper who has won an Olympic Gold Medal and multiple Star World Championship titles. 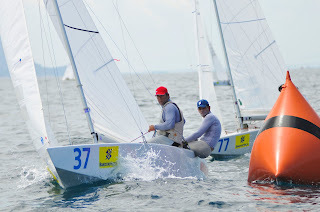 Tomas Hornos and Luis Hornos (USA) - the top Junior skipper at the 2010 Star World Championship is Tomos Hornos. Tomas sailed with his father, Luis, the District 1 Secretary. Tomas is the 2007 Snipe World Champion. The father and son combination finished 44th overall. Gastao Brun and Gustavo Kunze (BRA) - The 2010 Star World Champion Regatta Chair, and his family have been working around the clock helping to make the regatta perfect. Brun is the 2008 South American Champion and the 1990 North American Champion, and a lengthy list of other victories. 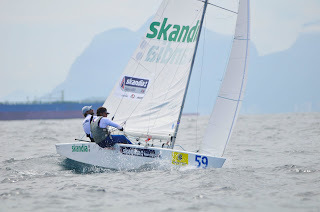 Brun won the warm-up regatta and had two races in the top ten, including on Wednesday, the day that half of the top ten teams to cross the finish line were Brazilian. 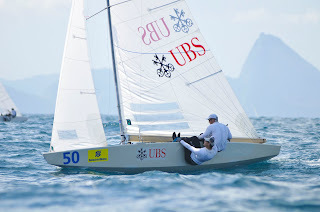 Gustavo Kunze sailed Optimists and Lasers and started crewing with Brun in 2007. They finished 16th overall, ahead of all of the Junior, Master and Grand Master teams.